The Jamaican Caves Organisation, the JCO, was founded in 2002 by a group of cavers who had been actively exploring the Jamaican underground since 1987, but who until then had no formal structure that would assist in the coordination of expedition planning, and no publication in which to report their discoveries. It was this second factor, the lack of a venue in which to report discoveries, that was the main impetus for the creation of the JCO. 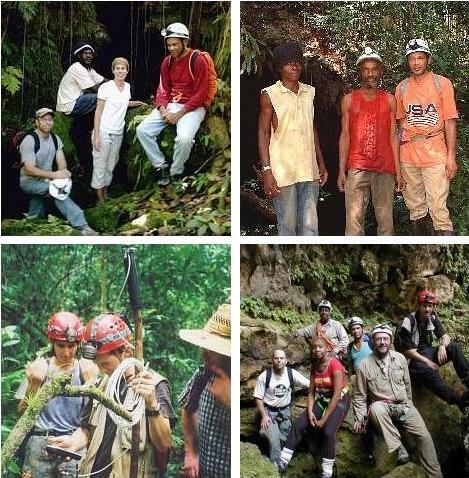 The only other caving group in Jamaica, the Jamaican Caving Club, JCC, had faded away several years prior to 2002 and there was nowhere to publish reports and maps. The increasing popularity and use of the internet by the general public suggested that it was time to give Jamaican caving an online presence, and concurrent with the formation of the JCO, a website, www.jamaicancaves.org, was launched. The mission of our group, from even before the time we formed the JCO, has been consistent: we want to preserve what we love. The way that we have found to best do this is through education, and research. The website assists in getting out the message that caves are special places, and our explorations and research endeavours help to support preservation by giving greater arguments to justify their protection. Unfortunately, many people see these wonderful underground worlds as nothing but frightening, dark, holes in the ground. In reality, caves are biological islands for the endemic cave-adapted invertebrate species that dwell in them. They contain valuable paleoclimatic records in the guano deposits of those caves that remain undisturbed, and the morphology of the passages themselves reveals the conditions of past epochs. More directly of importance to those people who live near the caves, the bats that some of these caves harbour are important pollinators, and eliminators of mosquitoes. The river caves supply much of the drinking water for many parts of the islands, and the siltation and catchment conditions are critical in maintaining the integrity of the water-supply. The importance of caves to the environment of Jamaica cannot be overstated. The JCO team is made up of both Jamaican nationals and foreign cavers. Our group can be broken down into two categories: Cavers and Collaborators. Some of the scientists that we consult with, and assist, do not actively cave as part of our group but are very important, nonetheless. Stefan Stewart - Canadian national. Jamaican at heart. Founder and head of the JCO. Specializes in assessment and georeferencing. Jan Pauel - Jamaican national. On-island head of the JCO. Excellent technical caver, mainstay of the outreach program, and our main videographer. Guy van Rentergem - Belgian national. Excellent technical caver. Specializes in mapping. Amongst other works, created current Green Grotto map that one sees at the entrance to the attraction. Martel Taylor - Jamaican national. Excellent caver. Elizabeth Slack - American Peace Corps based in Jamaica. Excellent caver. Mark Bellinger - American Peace Corps formerly based in Jamaica. Excellent technical caver. Dietrich Roggy - American Peace Corps formerly based in Jamaica. Produced karst educational videos under auspices of JCO. Drew Snauffer - American Peace Corps. Major contributor to the Newport and Smokey Hole work. Good in a cave and good with a machete. Brian Zane - Jamaican resident. Set up STEA cave tours. Important member of the JCO crew. Andreas Haiduk - Jamaican resident. Solid, very brave caver, and our expert in hydrology. Adam Hyde - Head of the JCC. Excellent caver. Responsible for much of the best caving work done in Jamaica during the 1990's. Delroy Williams - Windsor crew. Dr. Donald McFarlane - Currently a Prof at the Keck. One of Jamaica's finest cavers, beginning with his days as part of the Liverpool U team, and continuing to today. Alan G. Fincham - Author of Jamaica Underground. Now retired to Cyprus, but with us in spirit. Miss Lilly Bolt - Jamaican national. Secretary of the JCO. Trudy-Ann - Freemans Hall - The most beautiful woman in Jamaica. Dr Stewart Peck - Prof. of Biology, Carleton U. We welcome others who might be interested to link with our group. There are no fees at this time. Membership is open to anyone who can be of practical assistance in our projects, and who also has a regular presence in Jamaica. That said, it must be noted that what we do is not for the faint-hearted. To be a part of the team, you must be able to learn to descend and ascend ropes that are hundreds of feet long; you must be comfortable worming your way through small muddy passages; and most importantly, you must not be afraid of the dark. The JCO is a non-profit organisation, but attempts to raise funding by way of a couple of different efforts. These mostly consist of guiding hikers across the Troy Trail, and other trails, in the Cockpit Country, and selling maps that we've created as part of our projects. Nevertheless, we are always operating at a net loss and it has a direct effect on the degree to which we can carry out our activities. Some of our group must scrape up much money for airfare for every expedition, and those who live in Jamaica are limited in the time they can allot to caving, not only by the costs of ground-transport, batteries, gear and ropes, but by the simple need to earn their daily-bread. We invite donations of both gear and monies that might assist us in our projects. We can promise that everything that is received will be applied completely to caving and will be thoroughly accounted for. We suggest that those who might be both wealthy and generous enough to sponsor our work see any donations as an investment in the future of Jamaica's underground environment. We would like to thank The Nature Conservancy for their recent funding, and also thank the NSS for their grant in Jan, 2005, for the St Clair Cave project.